When I was in college, I would study while watching television. It's strange but I could concentrate better when the TV was on. I wonder if others have or had this strange study habit. 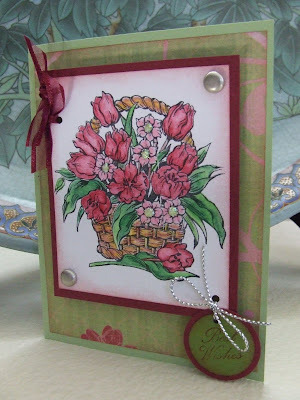 Anyway back to rubber stamping. . .this is a simple card. . .not too many blings to it. I feel that when you have a nice image, it's important to keep the card design simple so not to distract away from it. Why work so hard on coloring an image and making it pretty only to have the layout or the embellishment become the focal point?